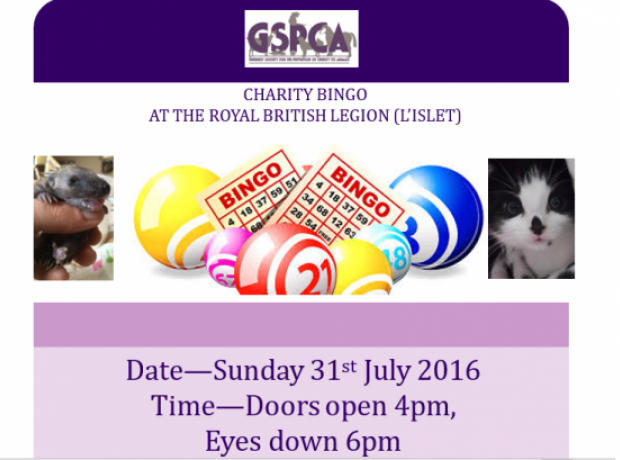 On Sunday 31st July 2016 at the Royal British legion in L'Islet a charity bingo and raffle is being held in aid of the GSPCA. Tickets go on sale at the end of June and will be available for £1 each at the GSPCA or please call 01481 257261 or pop into the Shelter in St Andrews. On Sunday the monthly charity bingo event held at the Royal British Legion in L'Islet was in aid of the GSPCA. The GSPCA are hugely grateful to everyone involved and especially Maureen and Carole two of the organisors. We must also say a massive thank you to those that donated towards the 90 lots of raffle prizes which were handed out on the night, each with a GSPCA bug toy.